Janise Crow opened “The Hair Lady” in State College in 2001. The business has grown from providing simple ponytail clip-on hairpieces to creating wigs for cancer patients. STATE COLLEGE — It’s more about heart than about hair. That’s one thing that becomes apparent as soon as Janise Crow starts talking about her wig boutique. Crow has been building her business since 2001, when she started selling ponytail clip-on hairpieces just for fun. Her customers at the time included local cheerleading and dance teams, who knew her as “The Hair Lady.” The name stuck and became the official name of her business, which is located at 2518 Sleepy Hollow Drive. It didn’t take long before she noticed there was a much bigger need than stylish hairpieces, Crow said. “Inevitably, I’d have someone come to me and say, ‘My friend or family member is going through chemo, do you have any wigs? '” said Crow. “And what really did it for me was, ladies would come to me in tears, because they weren’t able to find compassionate people to serve their needs. At the time, Crow only carried small hairpieces and a few fashion wigs that were not medical-grade or meant for any sort of long-term use. She set out to learn about the industry. 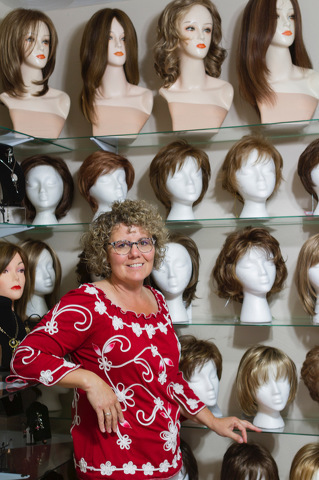 Crow, who operates her entire business from a converted bedroom in her Ferguson Township home, now carries a huge selection of wigs. While she continues to provide hairpieces to cheerleaders, dance teams, majorettes and other groups, the bulk of her time is spent serving oncology patients and women suffering from other kinds of hair loss, which afflicts 40 percent of American women, Crow said. Relying almost solely on word of mouth and referrals from oncology departments, Crow’s business is thriving and profitable today. However, due to familial obligations that are increasingly demanding her time and attention, Crow is looking to retire — but not until she finds the perfect person to take over her business. Crow said she will either offer the business as one complete unit, or in smaller, custom packages, depending on what the buyer may need. “If someone wants to buy the whole entity, that would include the name, the brand, the reputation that goes with it, all the inventory, the tangible assets, the marketing, the website, the social media, the client database and training. If someone needs wig training or business training, I can offer specialty training,” she said. Crow said the business could easily be adapted to fit into different settings and lifestyles. Crow said that the next “Hair Lady” does not necessarily need to have any specialized background or training. The No. 1 thing on Crow’s mind as she moves toward finding a buyer for her business is always her client base. For more information, visit www.mmhairfashions.com.